This article was originally published on June 26th, 2017, in the Ops & Blogs section of Times of Israel. The full article can be found on their website here. I received two phone calls in recent months, one from a good friend from college who is a lawyer and the other from my cousin who is a speech and language pathologist. Each had been asked to officiate at a wedding of a friend, so they called me, a rabbi who has officiated many weddings, for advice. They wanted to understand the different traditional Jewish rituals so that they could incorporate them into a meaningful wedding experience. They went online to get “ordained,” making sure that their weddings were legal in the states they took place, in addition to being legal “according to the laws of Moses and the people of Israel.” Neither of these weddings were interfaith weddings. In each case, the couple wanted someone to stand under the chuppah with them that they were deeply connected to, and also to have the ceremony be meaningful and sacred. These were also clearly conscious choices to not have a rabbi — or other clergy member for that matter — officiate. This was about the established institutions in the Jewish community failing to bring these families in. To be honest, I am not interested in having a discussion about rabbinic officiation at weddings in this forum, mostly because writing an opinion piece on a website is not the appropriate format for such a conversation. As it is, I expect plenty who will comment in agreement and disagreement. But as we’ve seen over these past several weeks in recent articles and op-eds, this conversation is filled with a multitude of opinions. Some are from a halakhic perspective, and some from a sociological one, some from personal experiences of joy, and some from personal experiences of hurt and heartache. All needs to be a part of any conversation in guiding one’s understanding of this. This conversation should be had in a appropriate way with respectful dialogue, respectful of one’s beliefs, but most importantly, of one’s choices. This conversation is not about hypotheticals. This conversation is about actual individuals and their choices. It turns out that in 2017, very few Jews care what rabbis say. Just look at The New York Times’ wedding announcements, and count the number of weddings performed by friends rather than clergy. Or ask around to find out how many people ask a rabbi when they have a question of Jewish law, and how many more turn to Rav Google. The question then is not “What should rabbis do? Officiate at interfaith weddings or not?” The question is: “What does it mean to be a rabbi at all?” And its corollary: “How can rabbis create connection and community for what I call “Jews and those who love us”? We welcome people of all ages, genders and backgrounds to join us on our journey – learned and novice; born Jewish, Jew-by-choice, or non-Jewish living Jewishly; single or partnered; gay or straight. We hope that all who enter find a Makom Kadosh – a holy space – in which to seek God, connection, and community. The Jewish Theological Seminary, my alma mater, of which I am a proud alum, came out with a statement last week that I was particularly critical of. First I wasn’t sure what they were trying to say – simultaneously reaffirming their age-old stance which seemed to be exclusionary while also striving to be welcoming, and using language at best missed the point and at worst was offensive. Most importantly, statements like this only make it harder for those of us in our communities to build the welcoming and inclusive institutions we strive to build. I believe this conversation is not really a conversation solely about rabbinic officiation. It is about the language we use and the culture we create. It is about how we make sure to connect with all whho identify as Jewish and all who have cast their lot with the Jewish people. It is about how we make sure all who are raising Jewish children feel welcome, regardless of their own faiths. If we fail to help people connect and we fail to create multiple entry points for them to connect, then nothing else matters. For years, educators have bemoaned the practice of teaching abstinence only in our school systems. To my knowledge, they did not disagree because it isn’t the best form of birth control, but because the facts on the ground tell us that our children are in relationships and they require more information than simply being told “wait till your married”. His point is that we need to do better than just saying ‘date someone who is Jewish’ and ‘marry someone who is Jewish” or ‘rabbis won’t officiate at your wedding.’ We need to give individuals meaningful spiritual experiences and connection so that they’ll want to make Judaism a core part of their identities and their lives. We need to realize that individuals are going to make the decisions that they are going to make, the decisions that are right from them, and we need to do better as communities to accept, and yes even celebrate, those decisions. We need to do a better job to celebrate those who want to be a part of our communities and make sure that they feel welcome. We can’t just open our doors wide and say “look how welcoming we are.” We need to show it with our actions. That won’t mean the same thing for everyone and every synagogue or Jewish communal institution, but that does mean that digging our heels in the ground does not do anything to make people feel welcome. It only turns people away. I truly believe that creating a welcoming and inclusive community is what is most important. Everything follows from that. We cannot create meaningful spiritual, sacred, educational, communal, social, and social justice experiences if we do not first ensure that someone feels welcome here. We as a Jewish community often only get one chance at making sure someone feels welcome. And if we miss that chance, then we will not be able to help someone grow in their Jewish journeys. We will not be there to help them build their Jewish homes and grow their Jewish families. We as a Jewish community – and Jewish communal leaders – must do better, to not judge other people and their life decisions, but to. Instead, we must truly welcome each and every person who we interact with, and help them navigate their own Jewish journeys, even if their journeys, and ultimately their destinations, may look different from our own personal ones. My father, Rabbi Kerry Olitzky, the greatest of all my teachers, has been a leading voice in this work, and spent almost two decades as Executive Director of the Jewish Outreach Institute/Big Tent Judaism. A number of years ago, he introduced me to their work with renowned Jewish demographer Sergio DellaPergola of Hebrew University, who calculated population projections for American Jewry through the year 2080. 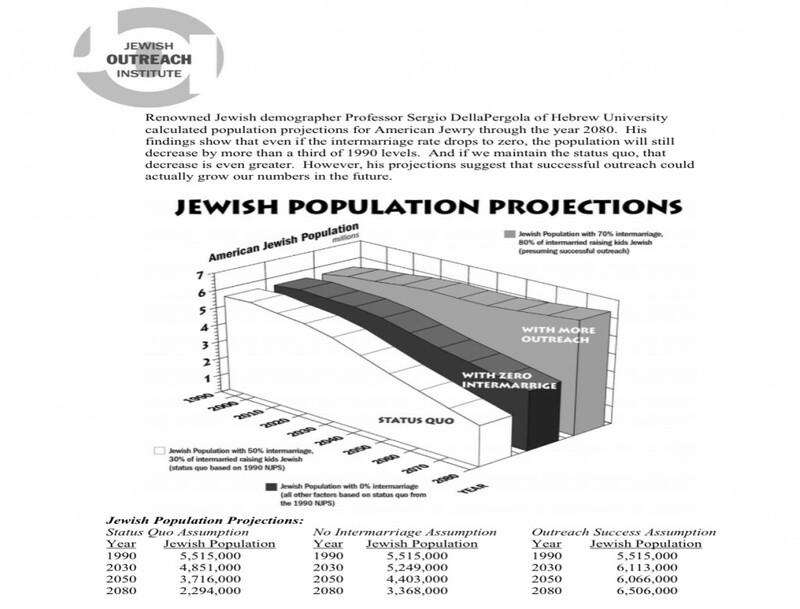 That study suggested that based on the status quo, the Jewish community from now until 2080 would decrease by millions. But get this: if there was no intermarriage, the population would still decrease by millions. But if the Jewish community was more welcoming and celebrated every family and welcomed them into our institutions, and truly understood the importance of outreach, then the size of the Jewish community would actually increase! This has proven to be the case. This past Shabbat, the Jewish community read from Parashat Korachand of Korach’s rebellion. Rabbinic tradition concludes that Korach’s rebellion fails because his rebellion was more of a coup to overthrow Moses as leader. But the essence of his words still resonate. You’ve gone too far! For all the community are holy, all of them, and God is in their midst. Why then do you raise yourselves above the rest of God’s people? (Num. 16:3). Rashi explains that when Korach says that all of the community is holy, he means that each person heard God’s voice at Sinai. Each individual is sacred. No person is anymore closer to God than anyone else, even Moses! Each individual is holy and we should not deny the holiness of anyone or of any decision they make, because of who they love, or because their Jewish family may look a little bit different than yours. When Moses heard this, he fell on his face (Num. 16:4). Rashbam suggests that Moses was praying and Ibn Ezra explains that Moses did so in a fit of prophecy. But I believe the Bekhor Shor is spot on: Moses fell on his face out of shame. Moses realized that there was a part of what Korach was saying that was true, that he was seeing some people as better than others, instead of seeing each individual as sacred. It doesn’t matter if a rabbi will officiate at a couple’s wedding if we fail to help that couple find connection to a rabbi, a synagogue, or the organized Jewish community at all. We need to ensure that everyone feels like they belong in the community. So let us no longer simply fall on our faces. Instead, let us see, and celebrate, every person as holy and welcome them in.